With the Rocinante laid up for repairs and Holden sticking around Tycho Station with the ship, crew members Naomi, Amos and Alex take some time off to tie up a few loose ends lingering in their personal lives. However, it wouldn’t be a novel in The Expanse series if things didn’t go pear-shaped pretty quickly. A rogue splinter group of the OPA dubbed “The Free Navy”, takes action against Earth after years of what they believe to be the blatant exploitation of the rights of “Belters” – folks who occupy the Asteroid Belt. After a vicious attack against Earth that leaves the planet devastated, the group then attacks Tycho Station looking to take out OPA leader Fred Johnson. 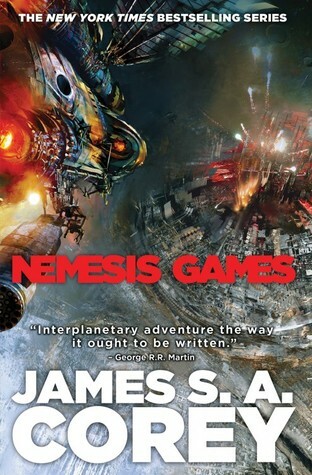 As every novel plays out from the alternating perspectives of several characters, for the first time Nemesis Games follows each member of the Rocinante’s crew. Naomi is tangled up as a hostage of The Free Navy, Amos is trapped on Earth witnessing the massive scale of destruction first hand, Alex is paired up with the returning Bobbie Draper on Mars looking for missing ships and Holden is working with the head of the OPA, Fred Johnson. Each viewpoint is from a different location in the universe as events unfold giving the reader a better understanding through familiar characters. It also helps to further develop a few of these characters that to date we’ve only seen through Holden’s eyes. With Nemesis Games, we’ve now hit the fifth book in the series and despite the chaos witnessed to date, it’s nothing compared to what is unleashed this time around – the scale of death and destruction is massive. Co-authors Daniel Abraham and Ty Franck (the two that make up the pseudonym James S.A. Corey) have turned The Expanse on its head and completely shaken up the balance of power, which is good considering we’ve now passed the halfway point with five novels down and a planned four to go. James S.A. Corey’s series continues to impress me. To date, there hasn’t been a bad book in the bunch. My only complaint being that I’ve now caught up with the release schedule so I have no new books to read! Talk about a first world problem.